The late announcement of a pair of a warm-up shows by Florence + The Machine at The Masonic prior to a featured prime-time performance at Coachella was a gift to their fans, serving both as an introduction to some of their newest material in their first US shows in two years along with helping to keep many tickets out of the hands of scalpers at the intimate venue. 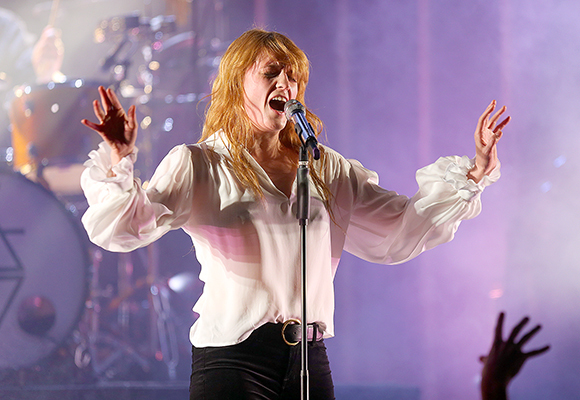 Led by the highly dynamic and animated Florence Welch fronting a five person band augmented by an additional five female backup singers, F+TM burst onto the scene with their debut album ‘Lungs’ in 2009, reaching number one in the UK with a highly appealing blend of energetic rock blending genres ranging from orchestral and romantic to soulful and dark, often incorporating religious imagery to their videos and live sets. The English indie rock band, first formed in London in 2007 stuck to the same set list on both nights, including five songs from the upcoming ‘How Big, How Blue, How Beautiful’, scheduled to be released on June 2nd, during their all too short 80 minute sets. 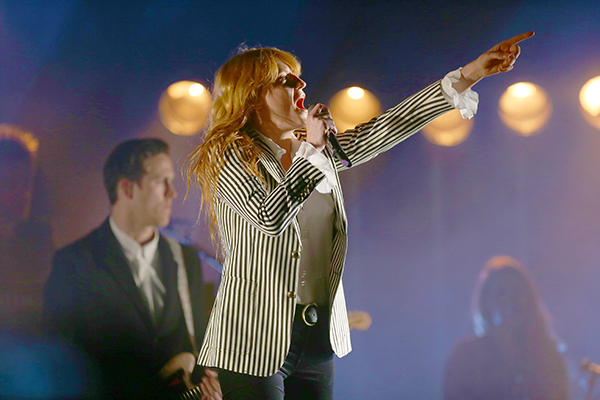 Making her entrance to the stage in a black-and-white striped suit jacket that was soon removed to reveal a white blouse with long flowing sleeves along with black jeans, Welch’s strong and impassioned vocals sent the ecstatic fans into a frenzy with a powerful rendition of “What The Water Gave Me” from 2011’s ‘Ceremonials’ to open the show as Welch repeatedly sprinted from one side of the stage to the other while adding a tambourine to the mix. Starting a pattern of alternating from old songs to new ones, the band next debuted the upbeat “What Kind Of Man” before “Sweet Nothing” from Welch’s collaboration with Scottish singer-songwriter Calvin Harris was presented with an almost revival like take on the EDM song with escalating beats. “How Big, How Blue…” followed, introduced by Welch as having been inspired by her first impression of the vast American sky with the lyric “We opened the door now it’s all coming true”. The high energy delivery of “All This And Heaven Too” preceded the pounding beats of “Drumming Song” before the introduction of “Ship To Wreck”, a catchy surefire hit in waiting off the new album that Welch wrote during a battle with sleeping pills that speaks of trashing her house and drinking too much while asking “Did I build this ship to wreck” The toned and always fashionable front woman then insured the fans increased euphoria as the always uplifting “Shake It Out” segued into the groups break thru, and arguably biggest hit “Dog Days Are Over” as she successfully exhorted the passionate crowd to jump in unison, creating a mass pogo fest throughout the audience as the band closed it’s regular set. Returning to the stage with “St. Jude”, a subdued new tune that was a questionable selection considering both the apparent strength of the new album and a number of choice cuts unplayed from the groups deep catalog, Welch and the band finished strong as the debut of the much more energetic “Third Eye” and the theatrical “No Light, No Light” showed no loss of energy as she turned into a whirling dervish once again bolting across the stage repeatedly to bring the performance to an end. 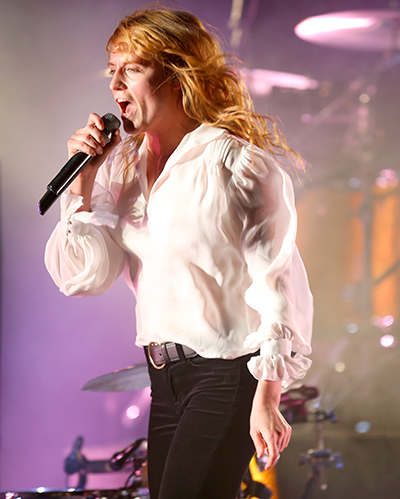 While it was certainly a coup to get an early introduction to the new material, hopefully Florence and company will return to the Bay Area again soon as part of a full fledged tour and play a longer set. Welch has quickly become one of the most energetic and appealing female lead singer in rock and the future looks bright. How Big, How Blue indeed………..